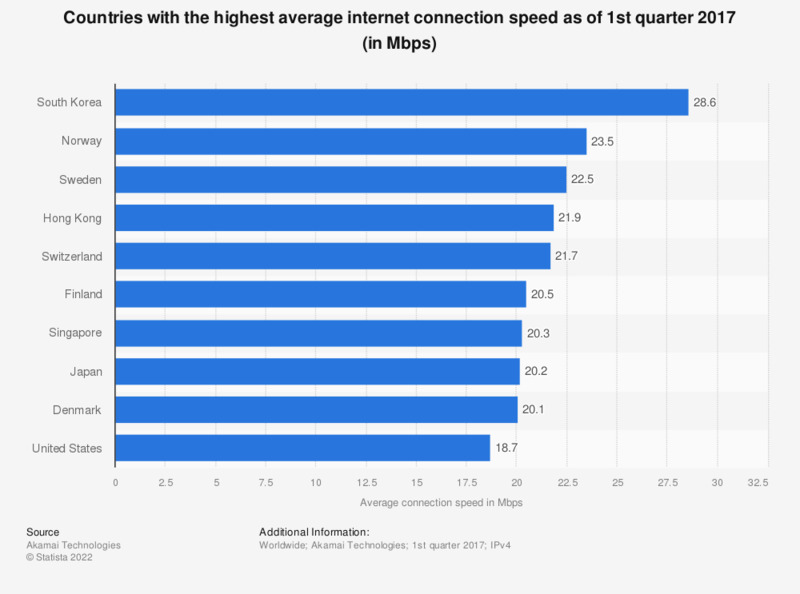 The statistic shows the countries with the highest average internet speed during the first quarter of 2017, measured in Megabits per second. During that quarter, IPv4 internet connections in Norway averaged a connection speed of 23.5 Mbps. The global average internet connetcion speed was 7.2 Mbps. Average internet speeds are higher in developed Asian countries; South Korea leads with an average internet speed of 29 Mbps more than 10 Mbps higher than Japan. This is a growth of more than 24 percent to the first quarter of the previous year. The U.S. states with the highest average internet speed include Delaware, District of Columbia and Utah, with first-ranking D.C. having an average internet speed of some 24 Mbps. That same year, 68 percent of internet users in South Korea enjoyed a internet speed of over 10 Mbps, which is classed as high broadband connectivity. Next in the 10 Mbps broadband adoption rate ranking are Switzerland and the Netherlands with 61 and 60 percent of high broadband connectivity. Both the Netherlands and Switzerland's relatively small size combined with their wealth are a significant factor in terms of telecommunications infrastructure upgrades. Up until the beginning of 2014, average internet speeds worldwide were under 4 Mbps and by the third quarter of 2015, global internet speed averaged at 5.1 Mbps.